I am always happy to be able to combine two of my hobbies -- in this case, meteorite collecting and stamp collecting. So far I have located only the following stamps commemorating meteorites or meteorite impacts. If you know of any others, please let me know. 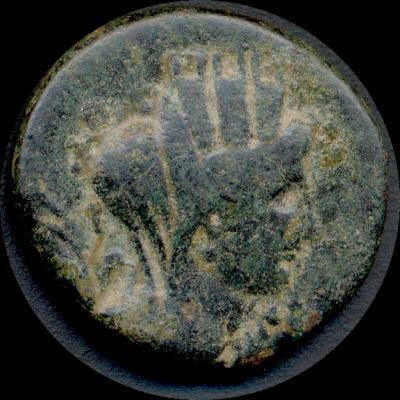 I have collected a few Classical coins which depict sacred stones such as the Stone of Emesa. Many of these stones were probably meteorites. Meteorites have been objects of worship and veneration all over the world from ancient times. You may click on the thumbnail images of each stamp or coin to see a larger image. I have also provided the Scott catalog number for each stamp if I know it. For some recent issues, I provide the World Numbering System value. This page was selected as a Stamp Site of the Week. 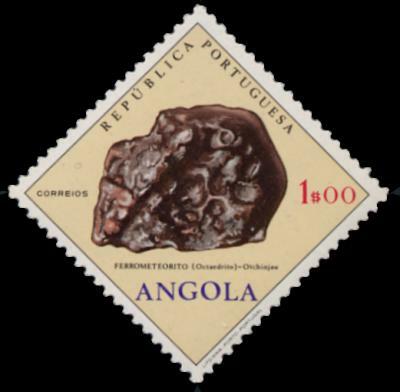 On October 31, 1970 Angola issued a stamp depicting the Otchinjau meteorite. Otchinjau is classified as an Of/IVA iron meteorite. It was found in 1919 in Cunene, Angola. The stamp depicts the regmaglypts often found on the surface of iron meteorites. These "thumbprints" result from ablation of minerals in the meteoroid as it is heated by its passage through the Earth's atmosphere. The Scott catalog number for this stamp is 552. 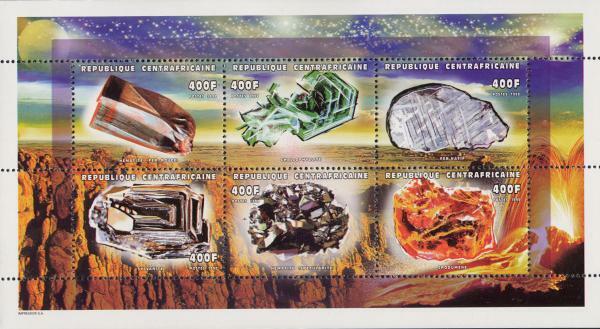 In 1998 the Central African Republic issued a sheet set of six stamps depicting minerals. One of the minerals, identified as "fer natif" (native iron) appears to be an etched slice of an iron meteorite displaying its Widmanstatten pattern. The Scott catalog number for this sheet is 1261. 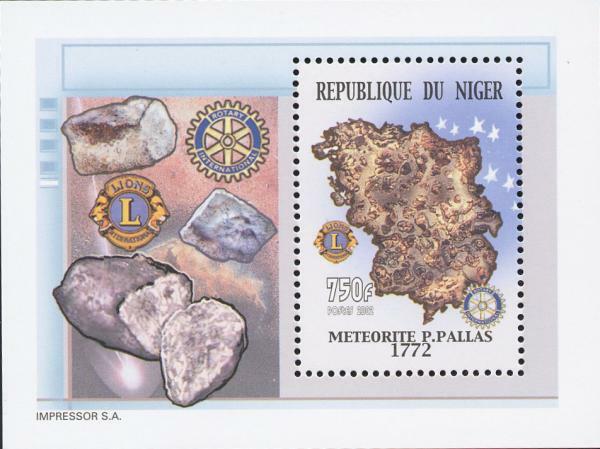 In 2001 the Republic of Chad issued two sheets depicting meteorites. 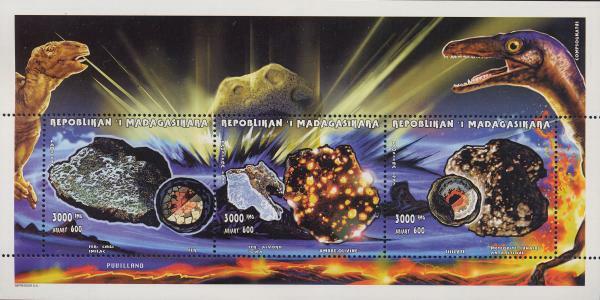 Each sheet contains four stamps and each stamp shows one meteorite. 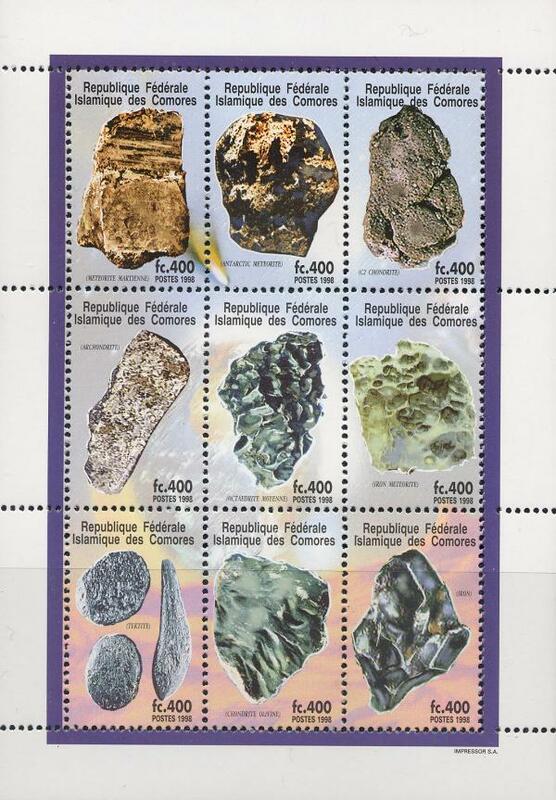 A fifth meteorite appears in the bottom part of the sheet below the stamps proper. The first sheet (left) depicts a Martian meteorite from India (presumably Shergotty), a Martian meteorite from Nigeria (presumably Zagami), a Howardite from the United States (five are known), the iron meteorite Mundrabilla from Australia, and a mesosiderite from Poland (presumably Lowicz). The second sheet (right) depicts an Antarctic pallasite (presumably Theil Mountains), a bencubbinite from Libya (presumably Hammadah al Hamra 237), a pallasite from the former Soviet Union (possibly Krasnojarsk), an ordinary L-chondrite from China, and an ordinary L-chondrite from the United States. Both sheets also exist in imperforate form. Scott catalog numbers have not yet been assigned to these sheets. 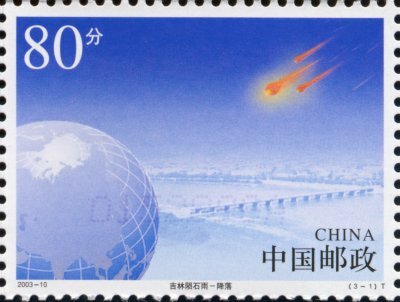 On June 21, 2003 the Peoples Republic of China issued three stamps depicting the fall of the Jilin meteorite shower. 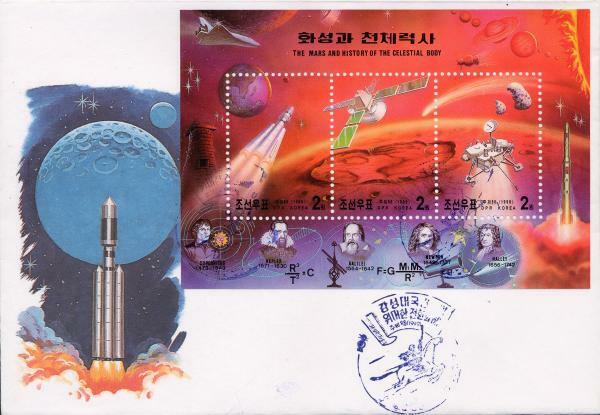 A first day cover bears all three stamps and a cachet depicting a meteorite shower superimposed on the outline of the largest recovered specimen of Jilin. At 15:01 Beijing time, on March 8 1976, a meteoroid massing around 15 tons entered the Earth's atmosphere at an angle of about 16 degrees and a speed of about 17 km per second. The meteoroid glowed brilliantly after entering Earth's atmosphere, appearing as a brilliant fireball to ground observers. The atmosphere acts as a very effective shield against stony objects of this size, slowing their cosmic velocities to a standstill and disrupting them. The usual result is that the meteoroid explodes spectacularly, like a brick hitting a stone wall. The Jilin object burst at a height of about 17 km above the northern suburbs of Jilin City in Jilin Province. This airburst registered as a magnitude 1.7 tectonic event on the Richter scale. 138 large stones and at least 3,000 smaller fragments rained down over a strewnfield measuring about 576 square kilometers in area (72 kilometers east-to-west by 8 kilometers north-to-south). Searchers recovered nearly four tons of meteorites from the Jilin fall. The largest single specimen of Jilin -- the main mass -- weighs in at a hefty 1,770 kg. It is the largest stone meteorite ever found. The main mass struck the ground at 15:02:36 near the western edge of the strewn field, just a couple of hundred meters away from a home. The impact produced a pit two meters wide and six meters deep. Two other large specimens weighing in a 400 kg and 123.5 kg landed fifteen kilometers east of the main mass. Incidentally, the largest known meteorite of any kind is Hoba, an iron meteorite which remains right where it fell in what is now Namibia. Jilin is classified as an H5 ordinary stony olivine-bronzite chondrite. This is one of the most common types of meteorites. Chinese tradition associated the fall of a meteorite with terrestrial happenings. Many saw the meteorite as presaging the death of Mao Zedong or the fall of the Gang of Four. Others suggested the fall heralded the devastation brought by the Tientsin-Tangshan earthquake which resulted in the deaths of 242,000 people. Still others linked the fall to the end of the the Cultural Revolution. 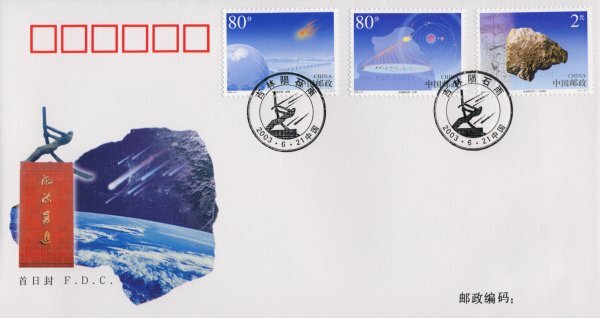 The first stamp depicts the Jilin meteoroid breaking up in the atmosphere. The fragments are headed for China. The eventual strewn field appears as a rectangle on the globe. The background shows Jilin City's Songhua River and Jilin Bridge. 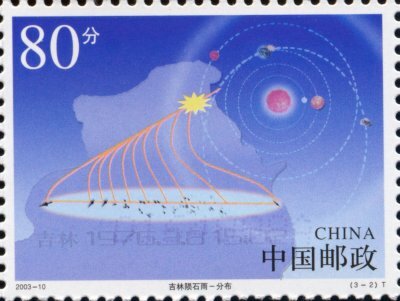 The second stamp depicts the possible orbit the Jilin meteoroid took to get to Earth along with the meteorite distribution area. A map of Jilin City and the time of the fall appear in the background. The light blue oval indicates the point at which the meteoroid exploded, and the area over which the meteorites scattered on landing. The third stamp shows the main mass of Jilin as well as the impact pit it left upon landing. While the stamp description claims this is the largest meteorite ever found, it is not. It is the largest stone meteorite, but larger iron meteorites are known. On August 1, 1991 Ciskei issued a set of fifteen individual stamps along with a minisheet containing all fifteen stamps depicting solar system bodies. One of these stamps sbows meteoroids in space. Meteoroids entering the Earth's atmosphere become meteors. Any surviving fragments of the meteoroid which land on the Earth's surface become meteorites. The Scott catalog number for the meteoroid stamp is 170 and for the sheet of fifteen is 182a. 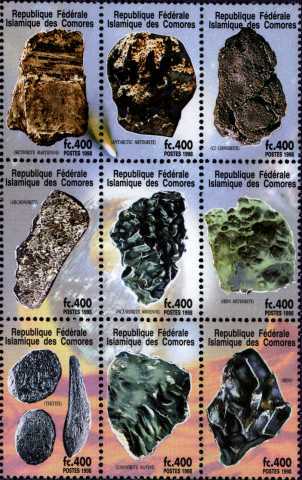 On January 1, 1998 the Comoro Islands issued a sheet with a set of nine stamps depicting meteorites and impact-generated materials including a Martian meteorite; an Antarctic meteorite; a C2 carbonaceous chondrite; an achondrite; three types of iron meteorites; three tektites; and an olivine rich chondrite. The Scott catalog number for this sheet is 931. 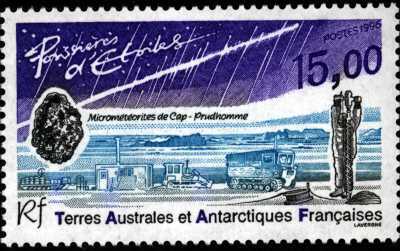 On January 1, 1996 the French Southern and Antarctic Territories issued a stamp commemorating the micrometeorites of Cape Prud'homme, Antarctica. The Scott catalog number for this stamp is 221. You may also view the first day cover. Many meteorites have been discovered in Antarctica because they stand out so easily on the ice and snow. Dust-sized micrometeorites have been collected at Cape Prud'homme located opposite the Station Dumont d'Urville. The accumulated ice is melted and filtered, leaving the tiny meteorite fragments visible. 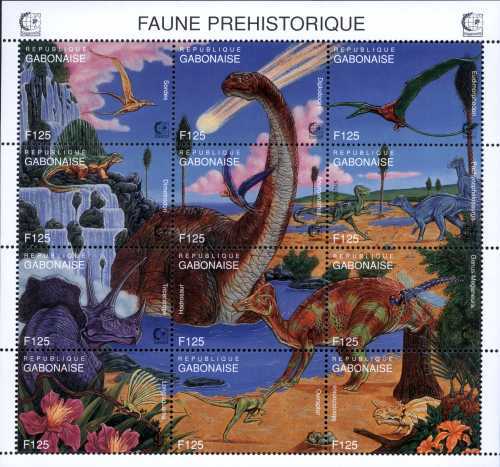 In 1994 Gabon issued three miniature sheets of twelve displaying prehistoric fauna. The sheet shown here includes the following animals: Sordes, Diplodocus, Eudimorphodon, Dimetrodon, Anuroenathus, Deinonychus, Pachycephalosaurus, Tricerotops, Hadrosaurus, Meganeura, Longisquama, Oviraptor, and Monoclonius. The background depicts the giant comet or meteorite which struck at the end of the Cretaceous. The Scott catalog number for this sheet is 800. About 15 million years ago a giant impactor between half a kilometer and a kilometer in diameter struck the Earth in what is today Bavaria, Germany. The impactor hit at about a speed of 25 km/sec, forming the 22 to 24 km wide Ries crater. Almost 3.5 cubic kilometers of rock evaporated, 2 cubic kilometers of rock melted, and 31.2 cubic kilometers of rock were ejected as far away as 40 kilometers. The resulting crater was about 240 meters deep. The local rocks melted and fused with portions of the impactor to form an impact breccia called Suevite. Suevite resembles the regolith covering the lunar surface. The smaller Steinheim crater (about 2.5 km in diameter) was formed at the same time as the Ries. The Ries impact event may also be the source of the tektites called Moldavites which are found in the southern Czech Republic. The Apollo 14 astronauts trained at the Ries crater because of its similarity to lunar craters. The town of Nördlingen lies within the confines of the ancient impact crater. Townsfolk used impact breccia to construct St. Georg's Church. This church may be the largest structure in the world composed of impact material. 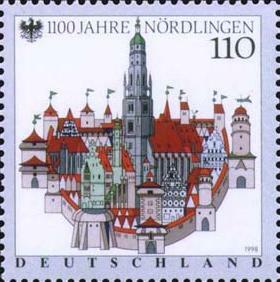 In 1998 Germany issued a stamp commemorating the 1,100th anniversary of the founding of Nördlingen. The stamp shows St. Georg's church with its famous "Daniel" tower, as well as portions of the surrounding town. This stamp is Scott #1989. In 1999 Germany issued a stamp shows the 1994 impact of Comet P/Shoemaker-Levy 9 onto Jupiter. At some point in the recent past Jupiter captured the comet into an unstable orbit about the planet. On July 7, 1992 this new moon of Jupiter passed very close to Jupiter -- within 1.4 Jupiter radii of the giant planet. Powerful stresses induced by this close passage dismembered the fragile comet. The comet was discovered on March 24, 1993 by Eugene and Carolyn Shoemaker and their colleague David Levy during a photographic observation session using the 0.4 meter Schmidt telescope at Palomar Observatory in California. Orbital calculations indicated the comet fragments would probably collide with Jupiter in July 1994. The whole world watched as twenty-one fragments struck Jupiter over a period of week beginning July 16, 1994. Observers were stunned by the spectacular fireballs which appeared as each fragment collided with Jupiter. Dark atmospheric scars persisted for over a year marking the impact sites. The diameter of some of these scars exceeded that of the Earth. Some of the impacting fragments may have been as large as 2 kilometers in diameter. This was the first opportunity ever for scientists to observe such a large collision of a comet with a planet. This stamp is Scott #B858. 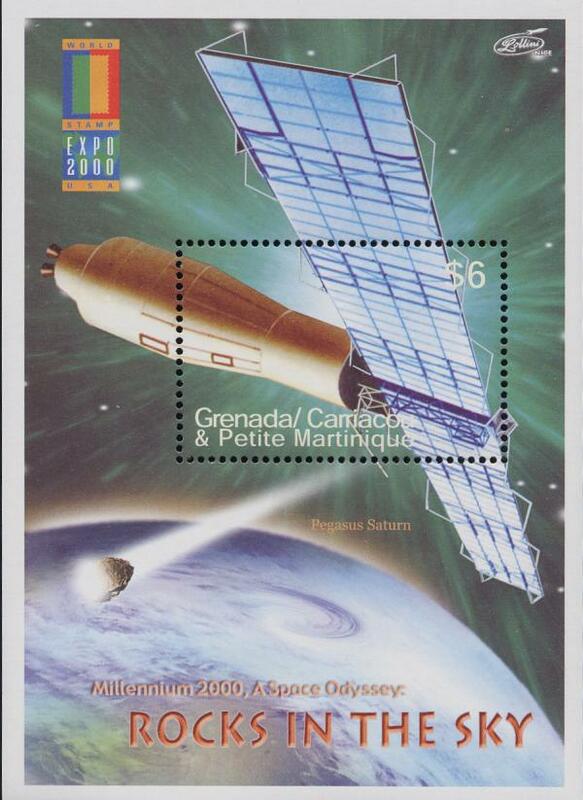 It is a member of a set of five stamps entitled "The Cosmos" issued in October, 1999. This set is the fiftieth welfare stamp set issued by Germany. The surcharge on the stamps supports the Federal Association of Free Welfare Work whose member organisations offer charitable assistance in cases where state aid does not suffice. 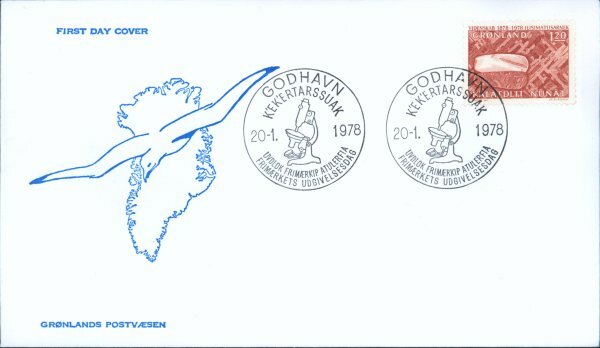 On January 20, 1978 Greenland issued a stamp to commemorate the Cape York meteorites. 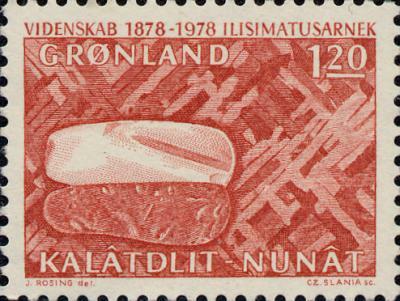 The stamp depicts tools crafted by Eskimos from the meteoritic iron against a background of the Widmanstatten pattern exhibited by the Cape York meteorites when etched by acid and polished. You can also view the first day cover. The Scott catalog number for this stamp is 107. See Bradley E. Schaefer's article Meteors that changed the world for more information about the Cape York meteorites. 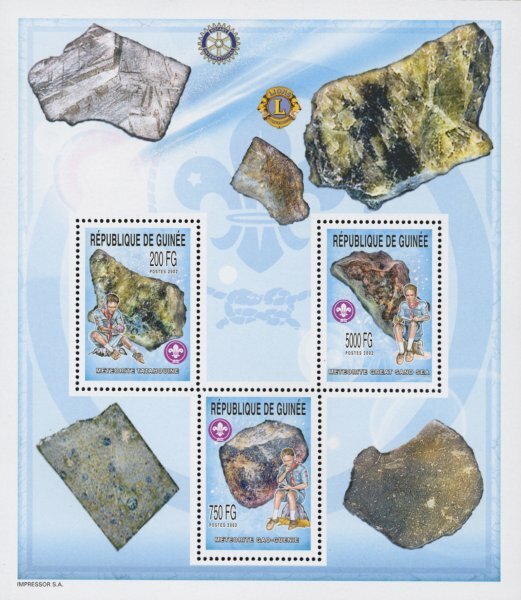 For the year 2000 World Stamp Expo the Grenada Grenadines issued two sheets of six stamps and two souvenir sheets in a series entitled "Rocks in Space." The Lollini family designed the stamps. 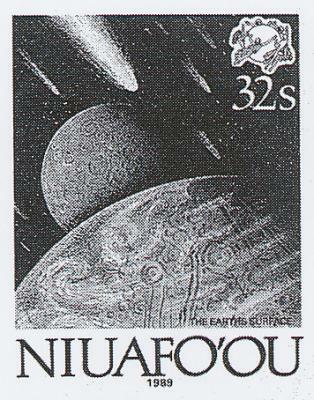 They have designed many space-related stamp issues. All four sheets depict a variety of satellites and space vehicles which have aided our understanding of comets, meteoroids, and asteroids. Two of the sheets actually display rocks in space. One sheet (Scott #2208) depicts a meteoroid entering the Earth's atmosphere and beginning to burn up. The sheet also names the Pegasus Saturn satellite. I am not sure the illustrated satellite is actually a Pegasus. NASA launched three Pegasus satellites using Saturn boosters in preparation for the manned Apollo program. The Pegasus satellites assessed the potential hazard from collisions of micrometeoroids with manned Apollo spacecraft. The results suggested micrometeoroids posed little threat to either the Apollo service or command modules. Another sheet (Scott #2206) contains six se-tenant stamps. Each nominally depicts a spacecraft important in the history of meteoritical research. However, another sheet in the series (Scott #2205) attaches the same six satellite names to completely different illustrations. Sheet #2206 also shows the impact of a fragment of Comet Shoemaker-Levy 9 with Jupiter in July 1994. The comet was discovered on March 24, 1993 by Eugene and Carolyn Shoemaker and their colleague David Levy during a photographic observation session using the 0.4 meter Schmidt telescope at Palomar Observatory in California. The comet had been disrupted by a close passage to Jupiter in 1992. Orbital calculations indicated the comet fragments would probably collide with Jupiter in July 1994. The whole world watched as twenty-one fragments struck Jupiter over a period of week beginning July 16, 1994. 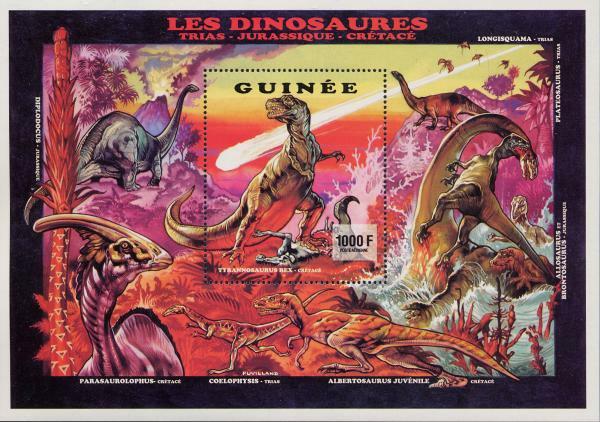 In 1993 the Republic of Guinea issued an airmail souvenir sheet showing several dinosaurs against the background of a volcano and an incoming cosmic impactor. This may represent the giant impact at the end of the Cretaceous, which may have caused the extinction of the dinosaurs. 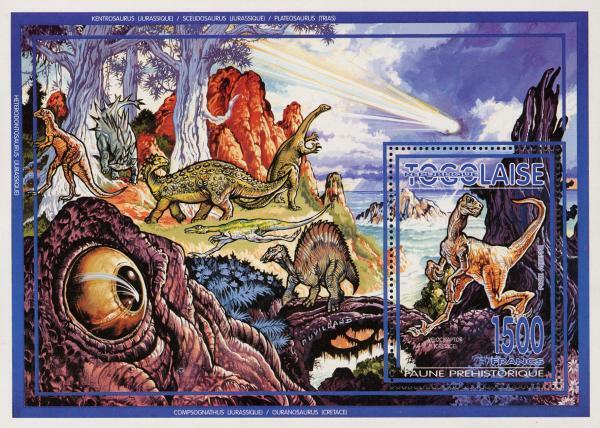 The dinosaurs pictured on the sheet include Diplodocus, Tyrannosaurus Rex, Longisquama, Plateosaurus, Allosaurus, Brontosaurus, a juvenile Albertosaurus, Coelophysis, and Parasauralophus. The Scott number for this sheet is 1239. 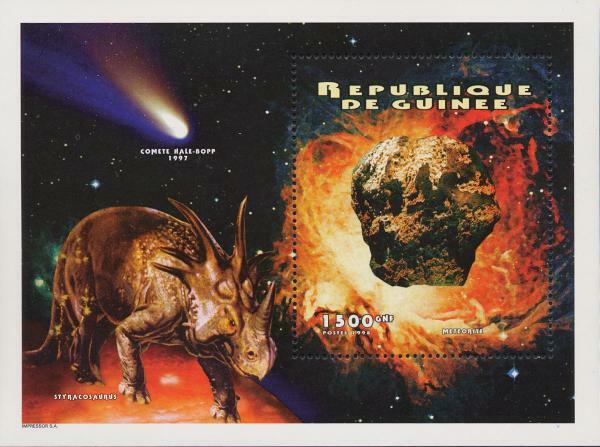 In 1998 the Republic of Guinea may have issued a miniature sheet showing comet Hale-Bopp which graced the night skies in 1997, a Styracosaurus, and a meteorite. Styracosaurus, whose name means "spiked reptile", was a ceratopsian dinosaur of the late Cretaceous period. Styracosaurus possessed a large nose horn and notable spikes on its frill. This sheet is not listed in the Scott catalog. It may not be a legitimate issue. Guinea is one of the countries in whose name bogus stamp issues have been issued in recent years. 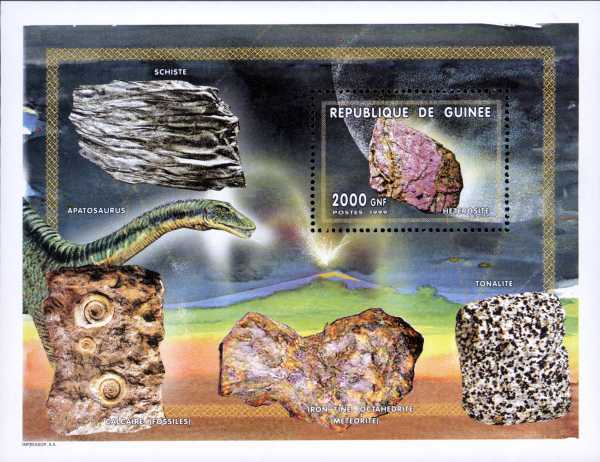 In 1999 the Republic of Guinea may have issued a miniature sheet showing an apatosaurus and five rock specimens against a volcanic background. The rock specimen in the middle of the bottom row is an iron meteorite, a fine octahedrite. Perhaps the best known examples of fine octahedrites are specimens from the Gibeon meteorite shower which fell in prehistory in Namibia. The other four rock specimens depicted are crystalline shale (upper left), limestone containing fossils (lower left), tonalite (lower right), and heterosite (upper right). 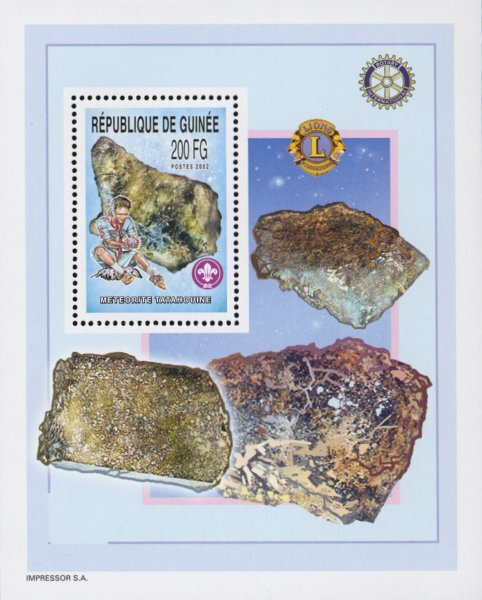 In 2003 the Republic of Guinea may have released three stamps depicting African meteorites. 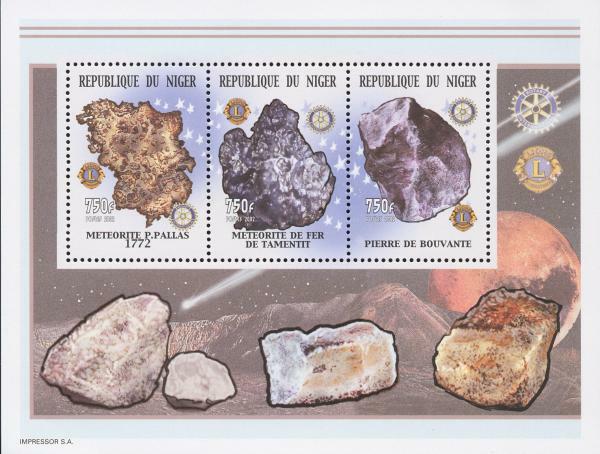 Each stamp appears on a minisheet of the same design depicting several views of (presumably) the same meteorite specimen. The symbols of the Rotary International and Lions club organizations appear on each minisheet. These three minisheets were also issued imperforate. These sheets may not be legitimate issues. 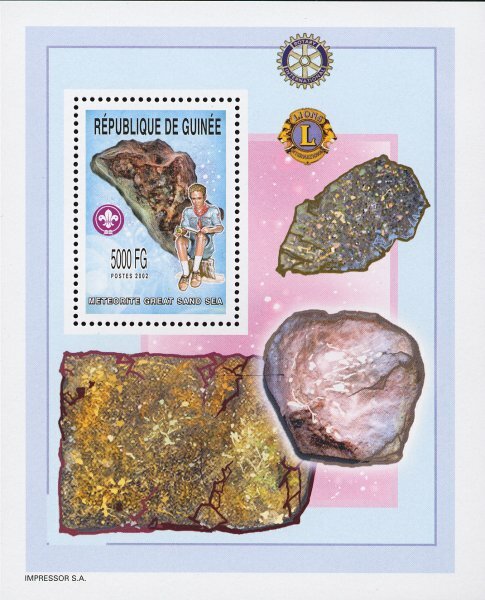 Guinea is one of the countries in whose name bogus stamp issues have been issued in recent years. 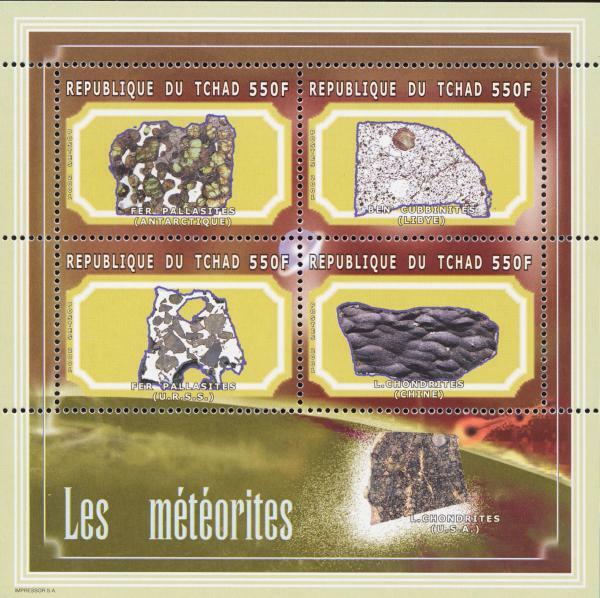 The first stamp depicts a specimen of the Tatahouine meteorite. This meteorite exploded in the atmosphere about two miles northeast of the Tunisian village of Tatahouine on June 27, 1931. Hundreds of fragments ranging in size from about 2 kilograms down to 1 gram landed over an area of about one square kilometer. About 12 kilograms in all have been recovered. Tatahouine is classified as a calcium poor diogenite, a type of achondrite meteorite believed to have originated on the asteroid Vesta. Specimens of Tatahouine are usually light olive-green in color and display a green crystalline structure crisscrossed by small black veins. These characteristics are well presented in the stamp image. 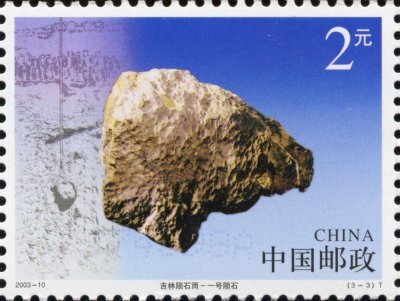 The second stamp depicts a specimen of the Gao meteorite, also known as Gao-Guenie. This meteorite exploded in the atmosphere and fell about 60 kilometers to the north of the town of Leo in Burkino Faso, Africa on March 5, 1960 at about 17:00 hours. Stones fell in a triangular area about 13 kilometers on each side. Some stones penetrated the roofs of village huts, but no one was seriously hurt. Estimates of the total weight of the specimens so far found range from 100 kilograms to 500 kilograms. Gao is classified as an ordinary olivine-bronzite chondrite. Many specimens display a beautiful dark brown fusion crust, evidence of the intense heating and melting of the outer layer of the meteorite as it fell. The third stamp depicts a meteorite from the Great Sand Sea, a name given to the Sahara desert region of Libya and Egypt. Many meteorites have been found in the deserts of North Africa in recent years, and the Great Sand Sea is no exception. In addition to meteorites, the Great Sand Sea is also the source of the mysterious Libyan Desert Glass, a type of tektite or impact glass perhaps produced by a powerful meteoritic airburst over the desert. This beautiful material resembles chalcedony in appearance and was used to create jewelry in ancient Egypt. For example, Pharoah Tutankhamun's breast plate features a centrally placed scarab carved from translucent yellow Libyan Desert Glass. 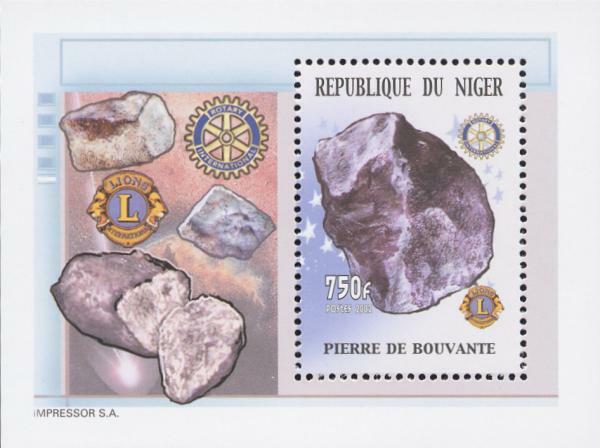 The three stamps also appear together on a souvenir sheet along with several unnamed meteorites in the foreground. This souvenir sheet was also issued imperforate. 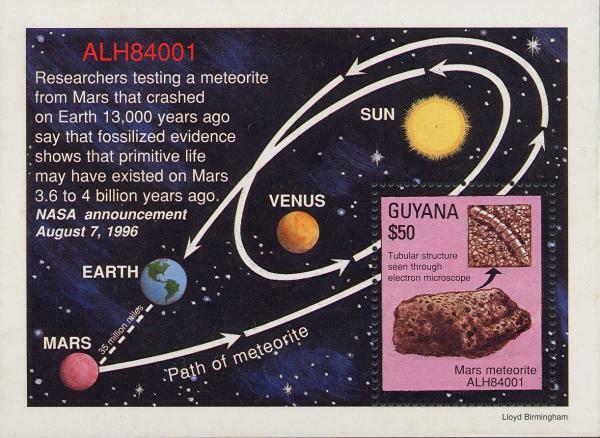 In 1996 Guyana released a souvenir sheet depicting the Martian meteorite ALH84001 and the orbital path it took to reach Earth after being blasted off the surface of Mars by a giant impact. ALH84001 is a 1.9 kilogram Martian meteorite found in 1984 on the Allan Hills ice field in Antarctica. Some scientists suggest this meteorite contains possible traces of biological activity as evidenced by tubular structures that look like fossils of primitive organisms. A magnified image of one of these tubular structures appears above the image of the meteorite itself on the sheet. See NASA's web page on Meteorites From Mars for more information. This sheet is not listed in the Scott catalog. It is listed in the Stanley-Gibbons catalog as MS4814 . 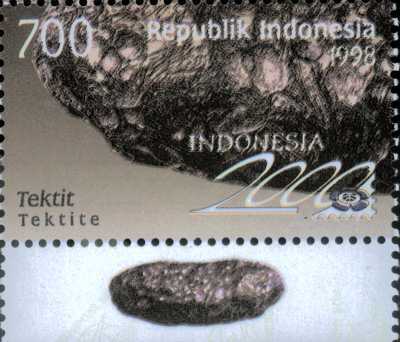 In 1999 Indonesia issued a tektite stamp as part of a series on minerals. Tektites are a type of impact glass formed during large impact events. The force of the meteorite impact melts sandstone into glass and lifts it outside the Earth's atmosphere. As the glass drops rain back to Earth, their passage through the atmosphere shapes them into a variety of forms such as spheres, cylinders, dumbbells, and buttons. These glassy drops eventually cool and solidify into tektites. A few scientists still believe that at least some tektites were formed in lunar volcanic eruptions and ejected to Earth by the force of the eruptions. 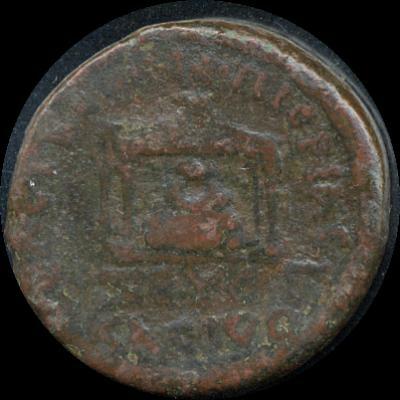 This tektite stamp is Scott catalog number 1766. Other stamps in the series (Scott numbers 1764-1767) depict chrysopal (1764), petrified wood (1765), and amethyst (1767). 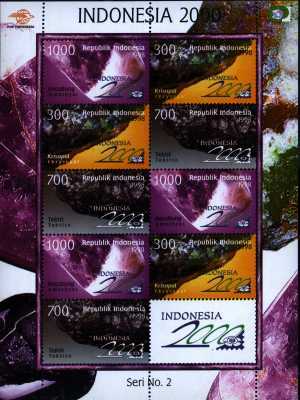 The stamps for tektite, amethyst, and chrysopal also appear together on a souvenir sheet which is Scott catalog number 1767a. The tektite also appears inside a limited edition souvenir booklet. 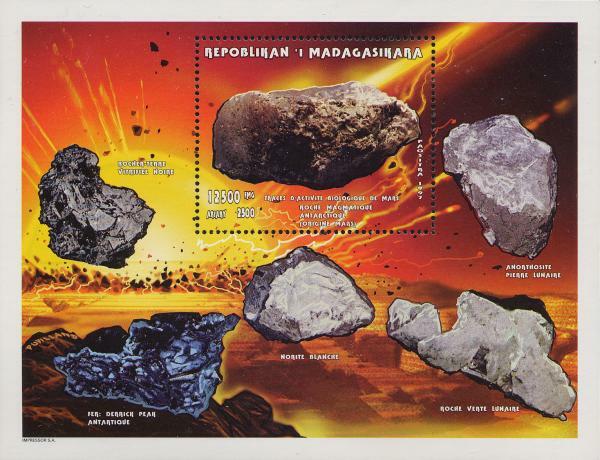 In 1998 Madagascar issued two souvenir sheets displaying meteorites. The first sheet displays three meteorites against a background showing two dinosaurs and the giant terrestrial meteorite impact at the end of the Cretaceous. The three meteorites shown are Imilac, a pallasite from Chile; Alvord, an iron meteorite (type IVA) from Lyon County, Iowa, USA; and an Antarctic lunar meteorite. The Scott catalog number for this sheet is 1349. 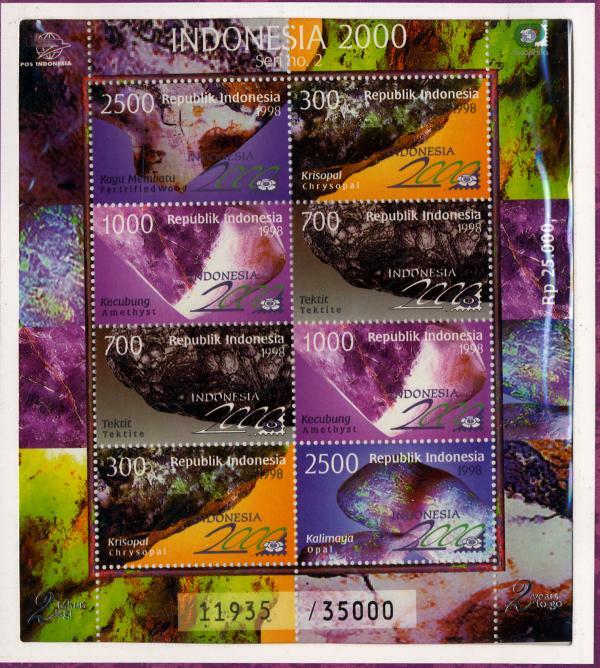 The second sheet displays within the main stamp area the 1.9 kilogram Martian meteorite ALH84001 found in 1984 on the Allan Hills ice field in Antarctica. Some scientists suggest this meteorite contains possible traces of biological activity. The background of the souvenir sheet portrays a giant impact which may represent one of those on Mars which blasted material from its surface into space. Some of this material eventually fell to Earth as meteorites, like ALH84001. The Martian meteorite is surrounded by two lunar meteorites and three terrestrial rocks. The Scott catalog number for this sheet is 1351. A companion sheet to these, Scott #1350, depicts terrestrial minerals: agate and dioptase; malachite and garnet; and chrysolite and wulfenite. See NASA's web page on Meteorites From Mars for more information about Martian meteorites. 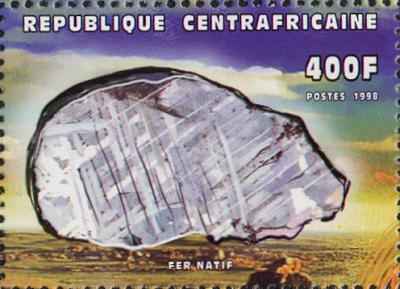 In 1999 Mali issued a miniature sheet depicting two terrestrial catastrophes. The catastrophe is the giant impact at the end of the Cretaceous. Three dinosaurs -- Sauropelta, Segnosaurus, and Tyrannosaurus rex -- are caught up in this disaster. The second catastrophe is the great Plinian eruption of Mount Vesuvius in 79 A.D. which buried the Roman cities of Herculaneum and Pompeii. Several people are shown trying to flee the eruption. At the bottom right appears the Eagle Station meteorite. Eagle Station was found in 1880 in Carroll County, Kentucky in the USA. Eagle Station is classified as a Pallasite. Pallasites are composed of olivine crystals set in a nickel-iron matrix. They probably formed in the boundary layer between the iron core and the stony mantle of an asteroid. Thin translucent slices of well-preserved Pallasites are very attractive and are used to create jewelry. The Scott number for this sheet is 1033. 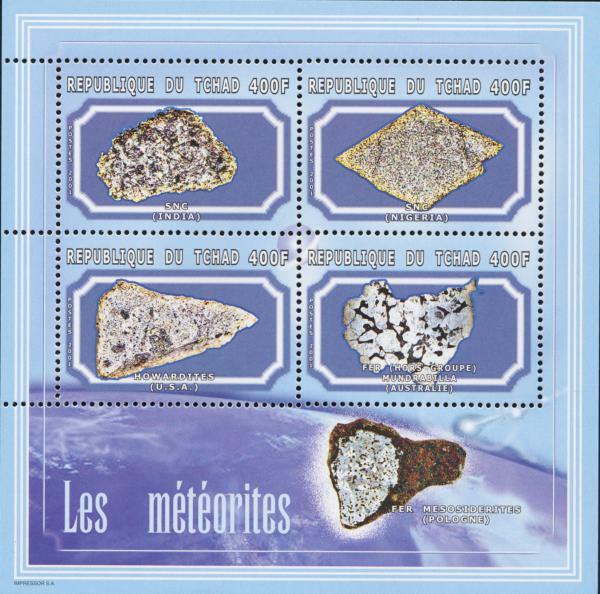 In 1999 Mali issued two miniature sheets showing meteorites. The first miniature sheet of nine depicts nine dinosaurs, each paired with a meteorite. Edmontonia appears with the Ensisheim meteorite which fell in Alsace, France on November 16, 1492. The Austrian emperor Maximilian decided it was a sign from God predicting his victory in battle against the French. And indeed Maximilian's army defeated a much larger French force at the battle of Salins. The meteorite probably received as much credit for the victory as Maximilian. Ensisheim is the second or third oldest witnessed meteorite fall for which any of the original meteorite survives and is definitely known to come from the fall. The oldest is a Japanese fall of May 19, 861. The second oldest may be Elbogen from what is now the Czech Republic. Some believe the extant specimens of Elbogen come from an observed fall in 1400. The remaining main mass of Ensisheim is still preserved in the church in Ensisheim where Maximilian ordered it kept. Ensisheim is classified as an LL6 stony chondrite. Iguanondon appears with the Saint Mesmin meteorite. Saint Mesmin fell May 30, 1866 in Aube, France. It is classified as an LL6 stony chondrite. Allosaurus appears with a Pallasite meteorite. As noted above, Pallasites probably formed in the boundary layer between the iron core and the stony mantle of an asteroid. Troodon appears with a Lunar meteorite. Lunar meteorites were probably blasted off the Moon's surface by large impacts. Lesothosaurus appears with the Bouvante meteorite. Bouvante was found July 30, 1978 in Drome, France. Bouvante is classified as a "Stannern Trend" Eucrite achondrite. This means it may be a fragment of the asteroid Vesta. Carnosaurus appears with the Axtell meteorite. Axtell was found in 1943 in McLennon County, Texas, USA. Axtell is classified as a CV3 carbonaceous chondrite. Deinonychus appears with a specimen of the Orgueil meteorite shower. Orgueil fell on May 14, 1864 in Montauban, Tarn-et-Garonne, France. Orgueil is classified as a CI carbonaceous chondrite, which means it may originate from a comet. Orgueil is famous because of claims that it contains tiny structures which resemble fossil algae. Dilophosaurus appears with the Douar Mghila meteorite. This meteorite fell August 20, 1932 in Morocco. It is classified as an LL6 chondrite. Psittacosaurus appears with a specimen of the L'Aigle meteorite shower. The L'Aigle shower fell April 26, 1803 in Orne, Normandy, France. Prior to this time European scientists viewed meteorite falls with skepticism, even when witnessed. The L'Aigle shower helped convince skeptics that rocks do fall from the sky. The Scott number for this sheet is 1031. 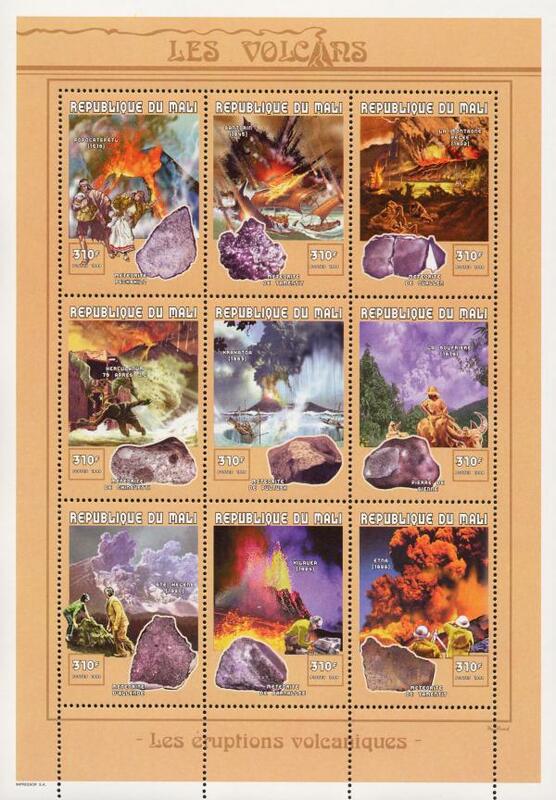 The second miniature sheet of nine depicts nine famous historical volcanos, each paired with a meteorite. Popocatépetl, which means "smoking mountain" in the Native American Nahuatl language, is located in south central Mexico in the state of Puebla. Over thirty six eruptions are known to have occurred within historical times. The sheet shows the eruption of 1519, the year the Spaniards arrived in Mexico. Cortez's army collected sulfur from the volcano to manufacture gunpowder to use in conquering the Aztecs. Popocatépetl remains an active volcano with moderate eruptions recorded as recently as April 2000. Popocatépetl is paired with the Peekskill meteorite (misspelled Peckskill on the sheet). The Peekskill meteorite fell October 8, 1992. A fragment weighing twelve kilograms struck and damaged a car in Peekskill, New York in the United States. The Peekskill meteorite may be the first fireball to be both recorded on videotape and have fragments recovered. Santorini is a small Greek island in the middle of the Aegean Sea. The eruption of Santorini (Thera) around 1628 B.C. was among the largest in the past ten thousand years. Ash produced by Thera reached as far east as Turkey and as far south as Egypt. The sheet shows the comparatively mild eruption of 1645. Santorini is paired with the Tamentit meteorite. This iron meteorite was first reported in the West in 1865. It was found in Tamentit Oasis in the district of Touat in Algeria. The local Arabs venerated the meteorite and considered it their talisman. The main 510 kg mass now resides in the Muséum National d'Histoire Naturelle in Paris, France. Pelée on the island of Martinique in the West Indies erupted violently in 1902. An incandescent high velocity cloud of ash, hot gases, and volcanic dust (a nué ardente ) completely destroyed the town of St. Pierre, killing all but three of the thirty thousand inhabitants. Pelée was the deadliest eruption of the twentieth century and probably the third most deadly of the past two thousand years. Pelée is paired with the Ouallen mateorite. This stony meteorite was found in Algeria in 1936. The most famous eruption of Mount Vesuvius in Italy took place in 79 A.D. This eruption buried the towns of Herculaneum and Pompeii. The sheet shows the lava inundating Herculaneum. Vesuvius is paired with the Chinguetti meteorite which was found in Mauritania in 1920. Chinguetti is a stony-iron mesosiderite. A Bedouin showed two French legionaires the location of a supposed giant meteorite as big as a house. Unfortunately the desert sands covered the meteorite. It remained lost until recently, when it was found again and determined to be just a large natural hematite formation. The meteorite fragments found nearby were unrelated to this formation. Krakatoa is an island volano located along the Indonesian volcano arc between the islands of Java and Sumatra. In 1883 Krakatoa erupted in one of the largest eruptions in modern times. The explosion was heard as far away as Rodriguez Island, over 4,600 km away. Ash fell on ships over 6,000 km to the west-northwest. Tsunamis towered as much as 40 meters above sea level, levelling everything in their path. Over 36,000 people lost their lives, and 165 coastal villages were destroyed. Over two-thirds of the original island of Krakatoa sank below the sea. Unusual atmospheric effects such as blue and green suns as well as exceptionally vivid red sunsets were observed world-wide because of the dust and aerosol particles injected by the eruption into the upper atmosphere. The temperature world-wide dropped by as much as 1.2 °C and did not return to normal until 1888. Krakatoa is paired with the Pultusk meteorite. A shower of meteorites totalling about 400 kg fell near Warsaw in Poland on January 30, 1868 at about seven o'clock in the evening. Thousands witnessed a bright fireball followed by the shower of tens of thousands of small stones from Pultusk to Nowy. Perhaps as many as 100,000 individual stones fell, but only a few thousand have so far been recovered. Pultusk is classified as a stony H5 chondrite. La Soufrière covers nearly one-third of the island of St. Vincent located at the southeastern edge of the Caribbean. There have been at least five major eruptions in historical times: in 1718, 1812, 1902, 1971, and 1979. The 1902 eruption occurred simultaneously with that of Pelée. The sheet shows the 1979 eruption which covered St. Vincent in ash. La Soufrière is paired with the Siena meteorite which fell near in Tuscany, Italy on June 16, 1794. Siena is classified as an LL5 chondrite. Mount St. Helens is located in Washington state in the northwestern United States. Mount St. Helens erupted volently in 1980. The sudden removal of the volcano's northern flank by an avalanche released pent-up pressure in the interior of the volcano. The volcano erupted laterally to the north and devastated an area of almost 400 square kilometers. Mount St. Helens is paired with the Allende meteorite. A shower of stony meteorites fell on February 8, 1969 in the state of Chihuahua in northern Mexico. The meteorite fragments covered a large area of over 300 square kilometers. Allende is classified as a CV3 carbonaceous chondrite. Specimens of Allende preserve evidence of the earliest processes in the formation of the solar nebula from which the Earth and other planets were born. The calcium-aluminum inclusions found in Allende suggest an origin in pre-existing interstellar grains which mixed with the forming solar nebula. Hence these inclusions are older than the Earth itself. Allende also contains a new form of carbon called fullerene, a soccer-ball shaped molecule of sixty or more carbon atoms. Some scientists claim Allende contains fossilized microorganisms of possible extraterrestrial origin. Kilauea in Hawaii is one of the most active volcanos in the world. Kilauea has been rift erupting almost continuously since 1983. The last summit eruption took place in 1982. The sheet shows the eruptive activity in 1984. Kilauea is paired with the Parnallee meteorite. Parnallee fell February 28, 1857 in Tamil Nadu, India. Two stones were found totalling about 78 kilograms. Parnallee is classified as an LL3 chondrite. Mount Etna is located on the Eastern coast of Sicily in Italy. Etna is the highest active volcano in Europe. There are over two hundred subsidiary craters and cones all around the mountain. Etna has erupted over ninety times since the eighteenth century B.C. At least ten eruptions since 141 B.C. have caused fatalities. The sheet shows the eruptive activity of 1986. Mount Etna is paired with an etched and polished slice of the Tamentit iron meteorite revealing the Widmanstatten pattern. The Scott number for this sheet is 1032. On October 14, 1986 Mauritania issued several stamps commemorating the return of Comet P/Halley, better known as Halley's Comet. One of these stamps, Scott catalog number 620, portrays the British astronomer Sir William Huggins (1824-1910) and the launch of the Giotto spacecraft atop the Ariane rocket. Huggins helped to develop the combined use of the telescope, spectroscope, and photography. He died in 1910, the year of the previous passage of Halley's Comet through the inner solar system. The European Space Agency launched Giotto to intercept Halley's Comet. On March 13, 1986 Giotto passed within 596 km of Halley's nucleus and returned the first close-up photos of a comet nucleus. Later in 1992 the spacecraft passed within 200 km of Comet P/Grigg-Skjellerup. The Scott catalog does not list the imperforate minisheet version of Scott 620. 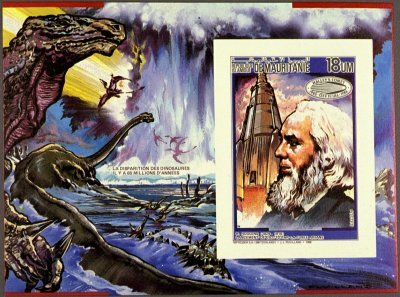 The minisheet frames the Huggins stamp with an artist's depiction of the giant impact at the end of the Cretaceous. That impact may have caused the extinction of the dinosaurs. 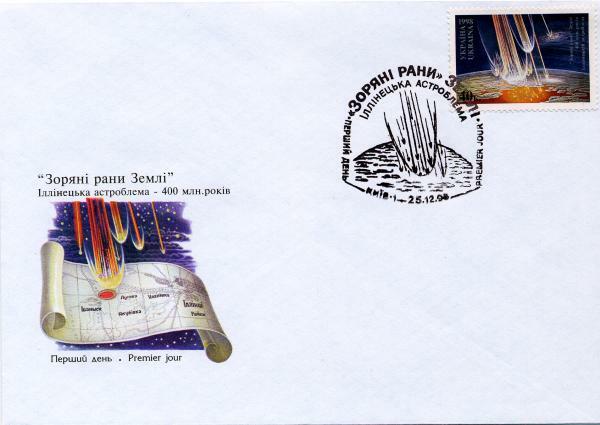 On June 20, 1977 Mongolia released a stamp which shows a fireball passing over a radio-telescope array. The stamp is part of a seven stamp set which also includes a souvenir sheet. The set commemorates the eleventh anniversary of the Intercosmos program in which nine socialist countries cooperated in space research. Fireballs occur when a large meteoroid (piece of space debris) enters the Earth's atmosphere. The meteoroid's kinetic energy of motion is converted to heat when it strikes the "brick wall" of Earth's atmosphere and is largely or completely vaporized. The vaporized material glows brilliantly to form the visible fireball. Sometimes fragments of meteoroids survive the fiery journey through the atmosphere to land on the Earth's surface, becoming meteorites. The Scott number for this stamp is C88. 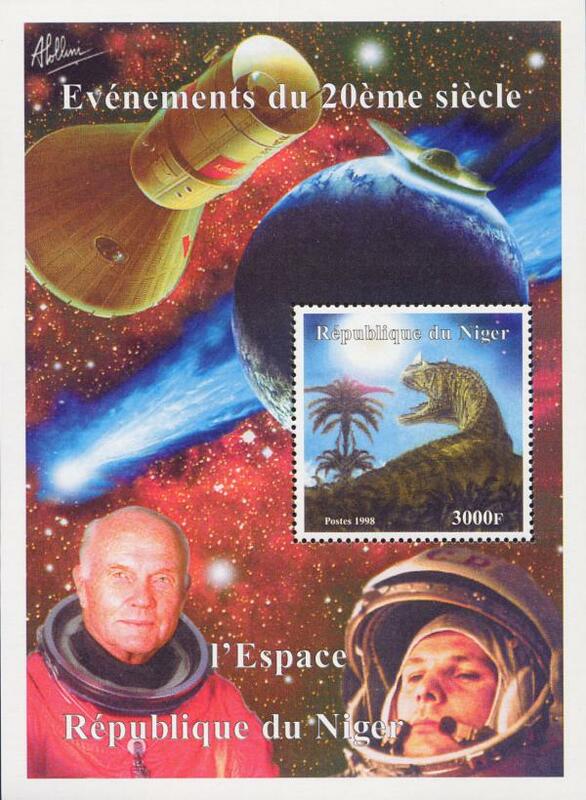 In 1998 the Republic of Niger nominally issued a souvenir sheet commemorating space-related events of the twentieth century. This sheet shows a giant impactor striking the earth, a comet (possibly Halley's Comet), astronaut John Glenn, cosmonaut Yuri Gagarin, and a Mercury space capsule. 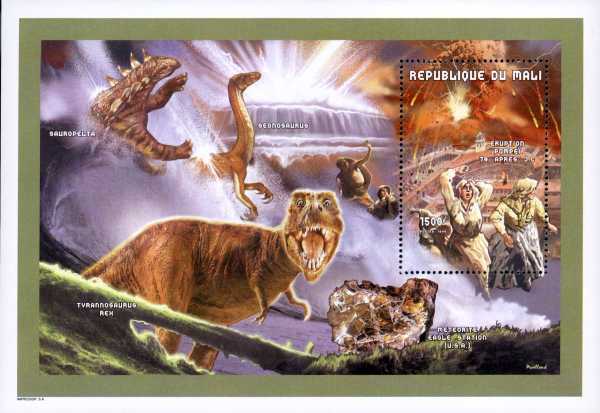 The embedded stamp depicts a dinosaur watching a giant impactor's fireball as it penetrates the Earth's atmosphere. The Scott 2003 catalog indicates this sheet was not authorized by the Niger postal authorities. It is not a legitimate issue. Gagarin, the "Columbus of the Cosmosm," became the first human in space and the first to orbit the Earth. On April 12, 1961 he completed a single orbit of the Earth in the Vostok 1 space capsule. Glenn was the first American to orbit the Earth. He completed three orbits in a Mercury capsule called the Friendship 7 on February 20, 1962. In October 1998 Glenn became the oldest person so far to travel in space, as a member of the crew of the space shuttle Discovery . The impact depicted on this sheet possibly represents that at the end of the Cretaceous which may have caused the extinction of the dinosaurs. If so, the impactor is drawn far too large. The end-Cretaceous impactor was probably about ten to twelve kilometers in diameter. The impactor shown on the sheet appears to be several hundred kilometers in diameter. The Earth has not been struck by an object of this size since very early in its history. 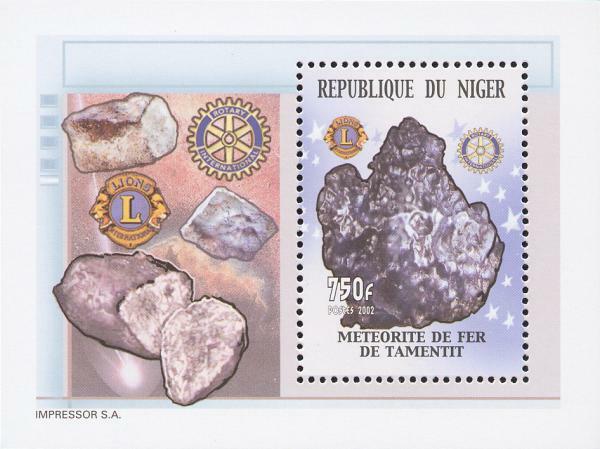 In 2002 Niger released three stamps depicting meteorites. 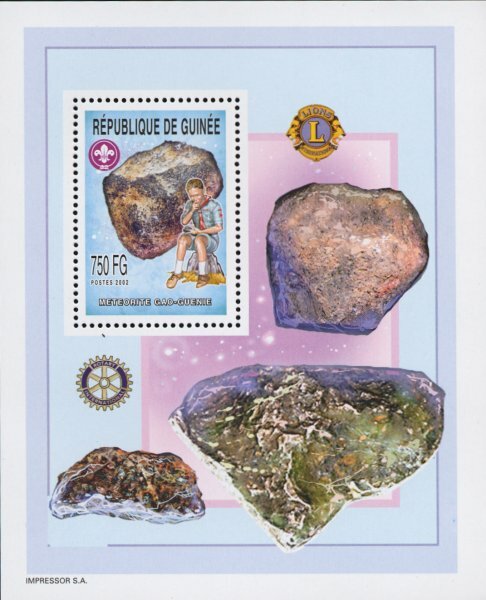 Each stamp appears on a minisheet of the same design depicting unnamed meteorites to the left of the stamp and the symbols of the Rotary International and Lions club organizations. The three minisheets were also issued imperforate. The stamps are legitimate issues and have been assigned official World Numbering System (WNS) values of NE10.02, NE11.02, and NE12.02 . 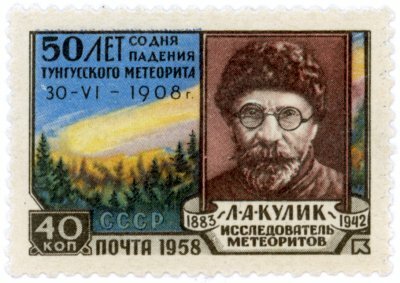 The first stamp depicts the Pallas meteorite, commonly known as Krasnojarsk among meteorite collectors. The Pallas meteorite is sometimes called the "foundation stone" of meteoritics since analysis of its chemical composition afforded a basis for those claiming meteorites had an extraterrestrial origin. The Pallas stone was found by a retired Cossack named Yakov Medvedev around 1749. Around 1771 or 1772 the stone came to the attention of the naturalist Pyotr Simon Pallas. Pallas, after whom the stone would later be named, was a German who conducted a wide spectrum of scientific investigations in Siberia under the aegis of the Tsar's Academy of Sciences in St. Petersburg. At that most academics dismissed the idea of stones falling from the sky, and Pallas was no different, although he recognized that the Pallas stone was definitely something unusual. Samples of the strange stone were sent to labs all over Europe. In 1776 the German chemist E. K. F. Meyer performed a chemical analysis of a sample of the Pallas stone and showed that it could not have had a human or volcanic origin. In 1794 Ernst Chladni, a German physicist, listed the Pallas stone as an example of a stone with an extraterrestrial origin. However, it was the English chemist Edward Howard and his French colleague Jacques-Louis Compte de Bournon who in 1802 first showed the basic similarities in composition among several different meteorites from different locations, including the Pallas stone. All of the meteorites contained nickel, not an element typically found in terrestrial rocks. The analyses of Howard and Compte de Bournon, among others, helped convince most scientists that stones really did fall from the sky, and that they did not originate on Earth. Meteorites with a composition similar to the Pallas stone are now called "Pallasites." Pallasites are composed of olivine crystals set in a nickel-iron matrix. They probably formed in the boundary layer between the iron core and the stony mantle of an asteroid. Thin translucent slices of well-preserved Pallasites are very attractive and are used to create jewelry. Roy A. Gallant provides an in-depth look at the importance of the Pallas stone in his article A Man Named Bear and His Meteorite: The Fall and Rise of the Pallas Nugget . The WNS number for this stamp is NE010.02 . 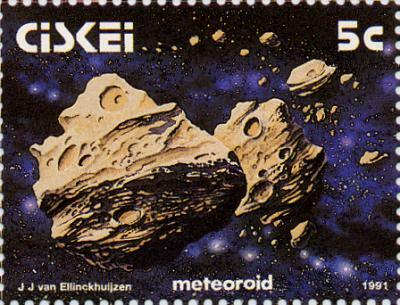 The second stamp depicts the iron meteorite Tamentit. This meteorite was first reported in the West in 1865. It was found in Tamentit Oasis in the district of Touat in Algeria. It may have fallen near the end of the fourteenth century. The local Arabs venerated the meteorite and considered it their talisman. The main 510 kg mass now resides in the Muséum National d'Histoire Naturelle in Paris, France. The WNS number for this stamp is NE011.02 . 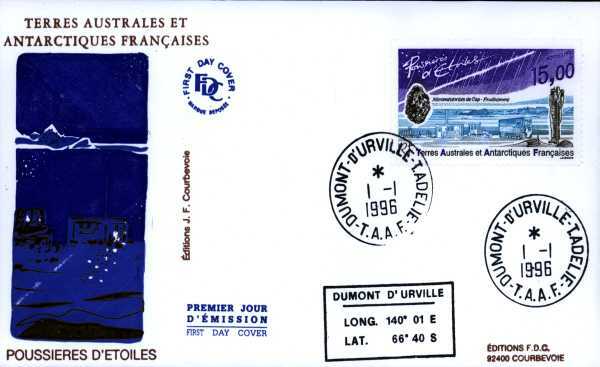 The third stamp depicts the meteorite Bouvante which was found July 30, 1978 in Drome, France. Bouvante is classified as a "Stannern Trend" Eucrite achondrite. This means it may be a fragment of the asteroid Vesta. Th WNS number for this stamp is NE012.02 . 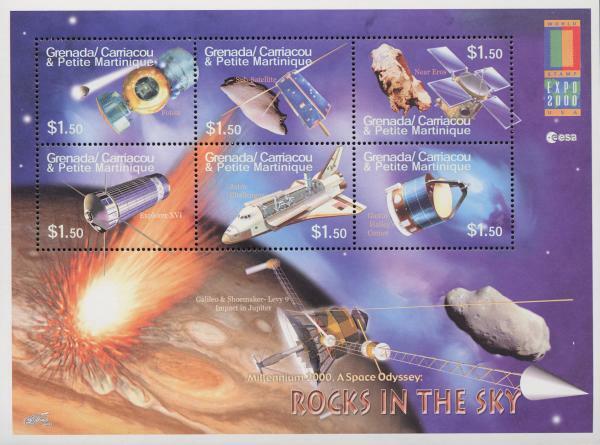 The three stamps also appear together on a souvenir sheet with the planet Mars and a comet in the background and the moon (or another rocky body) along with several unnamed meteorites in the foreground. The souvenir sheet was also issued imperforate. These stamps and the accompanying souvenir sheet have not yet been assigned Scott catalog numbers. 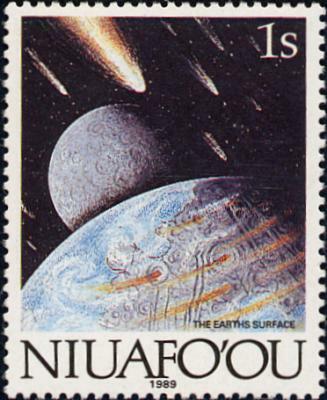 Between 1989 and 1993 Niuafo'ou (Tin Can Island) issued a series of stamps depicting phases in the history of the Earth. 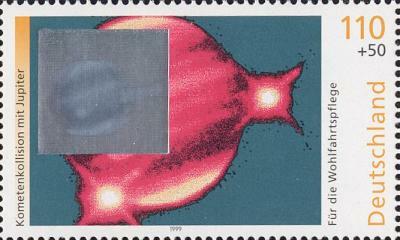 Among these is a stamp showing the early heavy bombardment of Earth's crust by cosmic debris. The Scott catalog number for this stamp is 108. It is a member of the set of stamps with catalog numbers 108 through 121A. The Earth and the other terrestrial planets (Mercury, Venus, Earth, and Mars) -- as well as Earth's moon -- experienced a major era of bombardment from 4.5 to about 3.9 billion years ago called the early heavy bombardment . Large impacts occurred frequently during this period. After this the cratering rate declined exponentially. Later impacts (after 3.3 billion years ago) occurred much less frequently and the impactors were smaller. 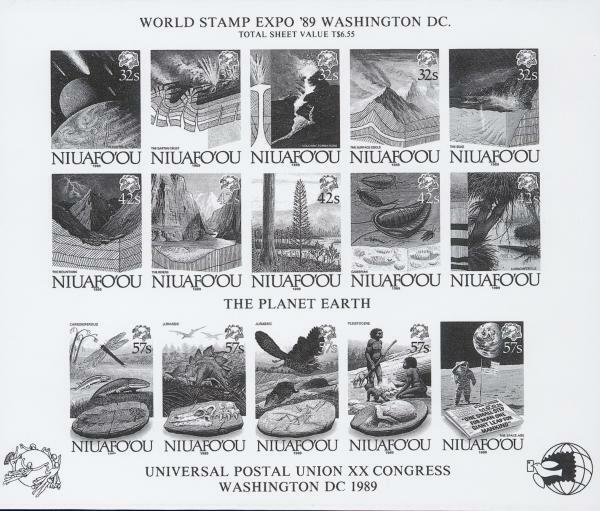 Also in 1989 Niuafo'ou issued a miniature sheet depicting the history of the Earth for the World Stamp Expo '89 held in Washington, D.C., USA. The sheet incorporates slightly altered images from the earlier 1989 set of stamps. Events range from the early heavy bombardment, shown at the upper left (basically the same image as #108 above), to the first manned lunar landing, shown at the lower right. The Scott number for this sheet is 123. Displayed here is an official black-and-white proof of the sheet. The sheet combines selected images from the set with Scott numbers 108-121. 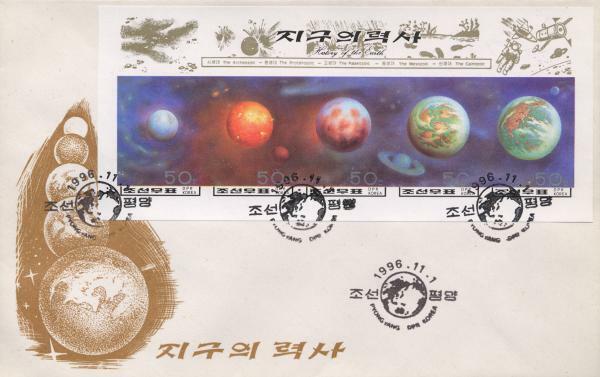 In 1996 North Korea released a miniature sheet of five stamps depicting the formation of the Earth. The second panel from the left depicts the early heavy bombardment of the Earth's crust by meteoric and cometary bodies. You may also view the first day cover. 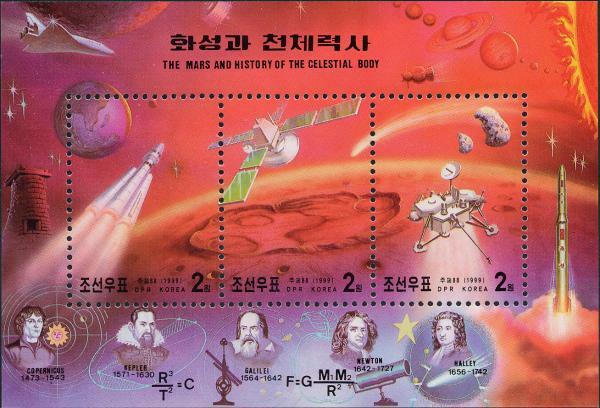 In 1999 North Korea released a souvenir sheet depicting people and events in the history of the study of Mars. The sheet includes two objects which may represent meteoroids blasted off the surface of Mars by giant impacts, or instead may represent the two moons of Mars, Phobos and Deimos. Phobos and Deimos are probably two asteroids Mars has captured. The sheet also portrays several famous astronomers: Copernicus, Kepler, Galileo, Newton, and Halley. Various rockets and space probes also appear against the background of the cratered surface of Mars. What looks like an old Korean astronomical tower appears at the left. You may also view the first day cover for this sheet. The Scott catalog does not list stamps of North Korea. The Michel catalog is usually used for these stamps. I do not know the Michel numbers for the sheets above. 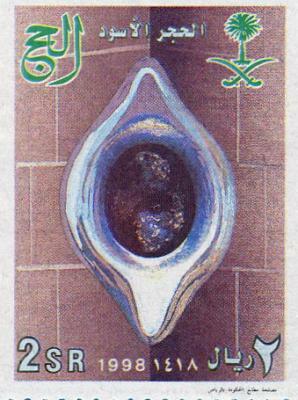 On March 29, 1998 Saudi Arabia issued a stamp depicting the holy black Kaaba stone in Mecca. The stone sits in the northeastern outside corner of the Kaaba building towards which Moslems pray five times daily. Moslems consider the Kaaba stone one of their holiest relics. Tradition says the stone fell from heaven, so it may be a meteorite or an impactite -- impact glass formed by sand and meteorite fragments fused together by the heat of a meteorite impact in sand. One Arabian source of impactite is the Wabar meteorite craters located about 1,070 kilometers east of Mecca. However, recent studies suggest these craters formed too recently to be the source for the Kaaba stone. See Bradley E. Schaefer's article Meteors that changed the world for more information about the Kaaba stone. The Scott number for this stamp is 1272. 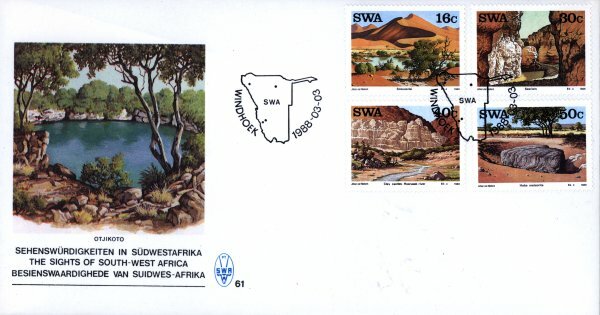 In 1988 South West Africa (now Namibia) issued a set of four stamps commemorating famous landmarks in that country as painted by Johan von Niekerk. Among these was the Hoba Meteorite, the heaviest known meteorite at around 60 tons. The Scott catalog number for this stamp is 601. The Hoba meteorite still lies where it originally fell. You can also view the first day cover. See the Grootfontein travel page for more about the Hoba meteorite. In 1957 the Soviet Union issued a stamp commemorating meteorite studies during the International Geophysical Year. 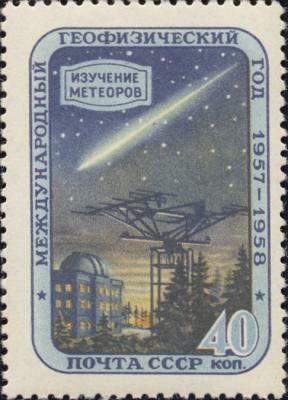 The stamp depicts a fireball (or, possibly, a comet) over an observatory. The International Geophysical Year (IGY) was an eighteen month period from July 1957 through December 1958 coinciding with a period of maximum sunspot activity. Scientists from sixty-seven different countries cooperated to study the solar-terrestrial environment. The Scott number for this stamp is 1958. 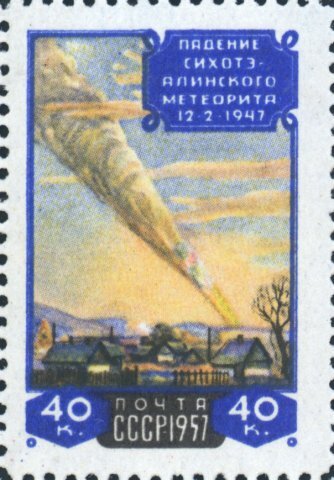 On November 20, 1957 the Soviet Union issued a stamp to commemorate the tenth anniversary of the Sikhote-Alin meteorite shower. The Scott catalog number for this stamp is 1995. 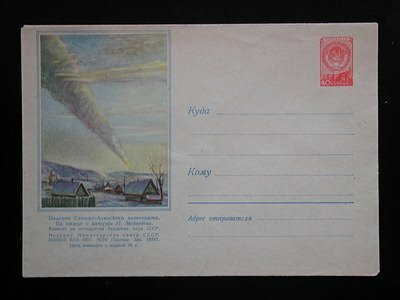 This stamp reproduces a painting of the Sikhote-Alin event by P. J. Medvedev showing the lengthy trail. The original painting can also be seen on this cover. You can also see a closeup of the cover text. Medvedev witnessed the Sikhote-Alin shower first-hand. The Sikhote-Alin impactor exploded in the atmosphere at a height of about 5.5 kilometers. Fragments landed in an ellipical area between one and two kilometers in size. Over 8,000 iron meteorites with a total weight of over 28 tons have so far been collected from the impact zone. See Roy Gallant's article about the Sikhote-Alin meteorite shower for more information about the Sikhote-Alin fall. 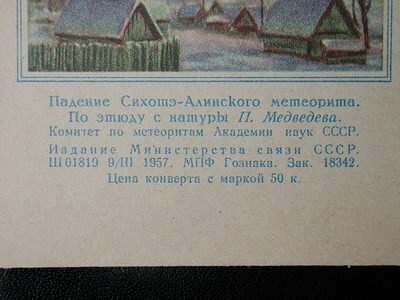 On August 12, 1958 the Soviet Union issued a stamp to commemorate both the 50th anniversary of the Tunguska impact event in June, 1908 and the seventy-fifth anniversary of Leonard A. Kulik's birth. Kulik led several scientific expeditions to Tunguska, including the first one in 1927. The Scott catalog number for this stamp is 2088. The exact composition of the Tunguska object is still debated. Some believe it was a stony body, while other believe it was a cometary fragment. In either case, the object exploded in the atmosphere with a force equivalent to between ten and twenty megatons of TNT. The resulting blast wave leveled hundreds of square kilometers of forest. See Roy Gallant's article about Tunguska for more information about the Tunguska impact. 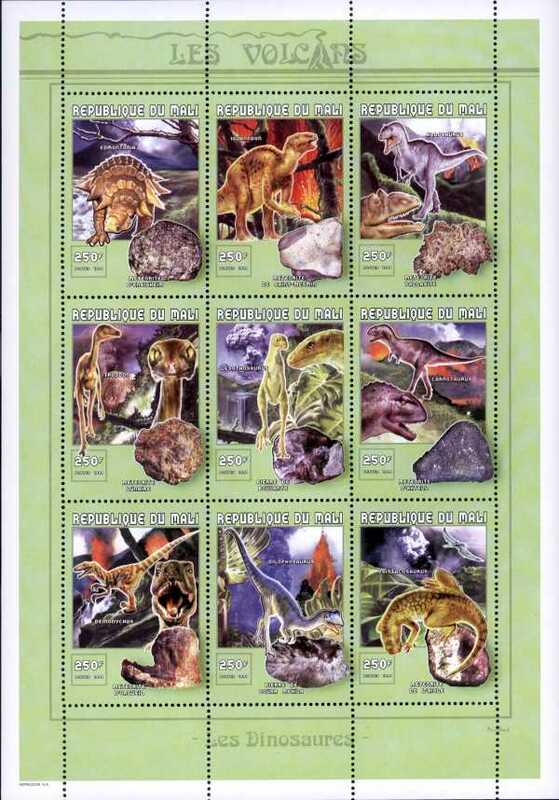 In 1998 Togo released a souvenir sheet showing prehistoric animals of the Jurassic and Cretaceous periods. A giant fireball in the upper right-hand corner of the sheet may depict the great impact event at the end of the Cretaceous. That impact may have caused the extinction of the dinosaurs. The Scott catalog number for this sheet is 1634. 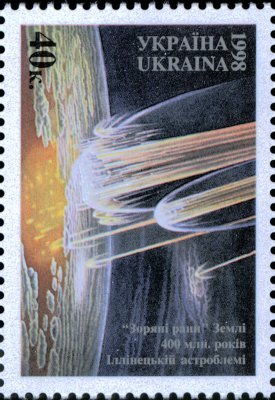 On December 25, 1998 the Ukraine issued a stamp commemorating the formation of the Ilyinets crater (astrobleme) in the Ukraine about 400 million years ago. This buried crater is about 4.5 km in diameter. The Scott catalog number for this stamp is 330. You may also view the first day cover. The image is based upon a work created by artist Donald E. Davis. Davis's original depicts the 1994 impact of fragments of Comet Shoemaker-Levy 9 on Jupiter. An impact crater forms when an asteroid or comet strikes another body such as an asteroid, planet, or moon at high speed. All of the surfaces of the inner planets and their moons (Mercury, Venus, Earth, and Mars) have been heavily bombarded. Because the Earth is so active geologically, most traces of impact craters have been erased by erosion and tectonic activity. Nevertheless, over one hundred seventy impact craters have been identified on Earth, among them the Ilyinets crater. Several more craters are found each year. Meteorites have been objects of worship and veneration all over the world from ancient times. In the classical world sacred stones of conical shape were particularly favored. The Temple of Aphrodite at Paphos on Cyprus housed a conical stone (an omphalos) sacred to Aphrodite Uranos. This stone, which still exists, has been determined to be a meteorite. Two other temples sacred to Aphrodite in Asia Minor also contained sacred stones which may have been meteorites: Aphaca and Byblos. 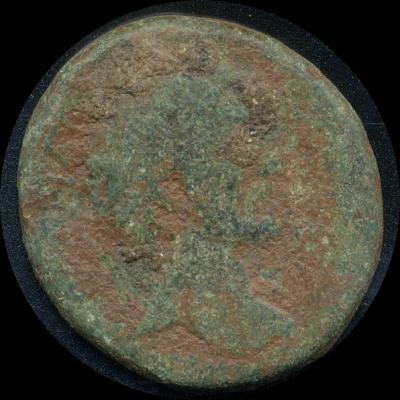 This Roman provincial coin was minted during the reign of Caesar Augustus (27 B.C. - A.D. 14). 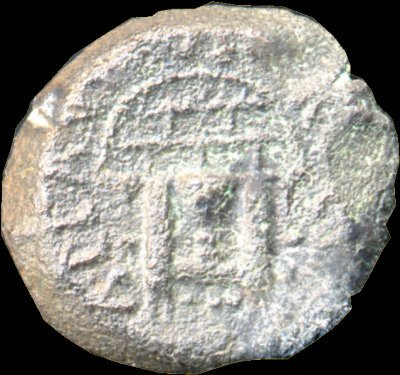 The reverse of the coin shows the sacred stone from the Temple of Aphrodite on Paphos within the semicircular courtyard. The front of the coin depicts the bare-headed bust of the emperor. This Roman provincial coin minted about A.D. 22-23 honors Drusus Julius Caesar (Drusus the younger), only natural son of the emperor Tiberius. The reverse of the coin shows the sacred stone from the Temple of Aphrodite along with a statue of Zeus Salaminios. 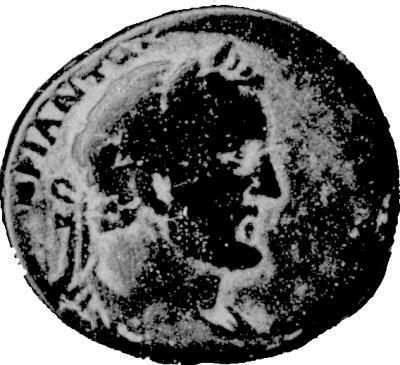 The front of the coin depicts the bare-headed bust of Drusus. Drusus (13 B.C. - A.D. 23) became heir apparent to the Roman throne after the death of Tiberius's nephew and adopted son Germanicus in A.D. 19. Drusus held several positions of authority, including that of Tribune starting in A.D. 22. Drusus died the next year, reputedly poisoned by his wife Livilla and Sejanus, Tiberius's advisor. Caesar Augustus rebuilt the Temple of Zeus Salaminios on Cyprus in 22 B.C. This temple was the major shrine of the city of Salamis, and one of the three most important shrines on Cyprus. 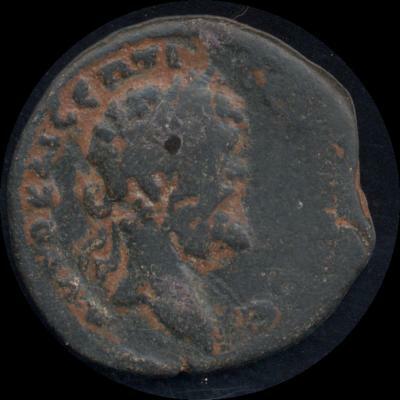 The reverse of this coin, issued during the reign of Trajan (A.D. 98-117), shows the sacred stone from the Temple of Aphrodite on Paphos on the reverse with a courtyard in front. The front of the coin depicts the laureate draped and cuirassed bust of the emperor Trajan. This image was probably struck from an imperial die. 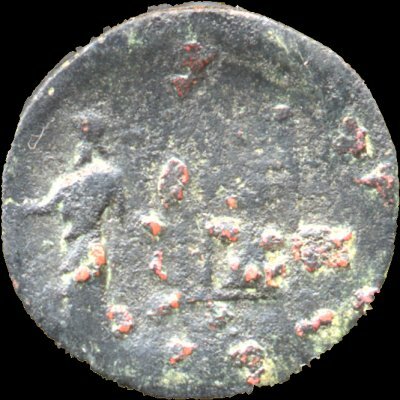 The reverse of another coin from the reign of Trajan depicts a canopied shrine supported by four columns and containing the sacred stone of Zeus Kasios. This sacred stone was probably a meteorite. The front depicts the laureate head of Trajan. 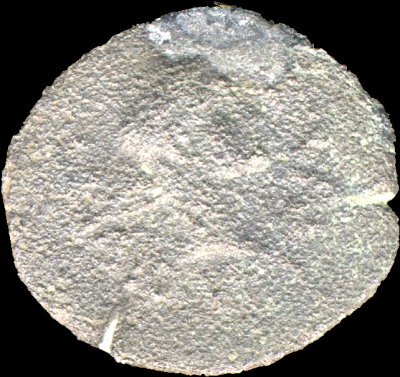 This coin was minted in Syria, at Seleukeia in Pieria. Seleukeia sat by the bay where the mouth of the Orontes river flowed into the Mediterranean. The famous sanctuary of Zeus on Mt. Kasios overlooked the bay. Roman emperors visited the annual festivals held at the temple. 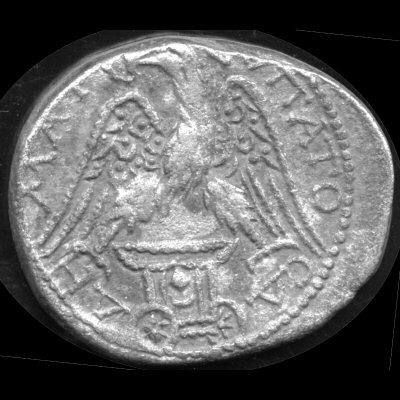 The reverse of a coin from the reign of Septimus Severus (A.D. 193-211) also shows the tetrastyle shrine containing the sacred stone of Zeus Kasios. Septimus Severus was the husband of Julia Domna and the father of Geta and Caracalla. Severus was also the uncle of Elagabalus. Severus was originally from Africa. His wife Julia was from Syria. Severus founded the Severan or Syrian dynasty which ruled the Roman Empire from A.D. 193 to 235. Probably the most famous sacred stone appearing on Roman coins was the Stone of Emesa. Most of the coins depicting the Stone of Emesa were minted during the reigns of the Syrian emperors. This sacred stone, which has not survived, was probably a meteorite. The Roman emperor most closely associated with the Stone of Emesa was Varius Avitus Bassianus. He is better known as Elagabalus after the name of his god. Varius was born about 204. As a boy he was consecrated a priest of the sun god in the great temple in Emesa. Varius succeeded his cousin Caracalla to the Roman throne in 218. He adopted Caracalla's official name Marcus Aurelius Antoninus. Varius reigned from 218 to 222 A.D. He insisted that the Stone of Emesa be an object of public worship in Rome. His unpopularity grew as his cruelty, extravagance, and depravity alienated all segments of Roman society. The Praetorian guards assassinated Varius -- only 18 years old -- and his mother in 222. The Stone of Emesa was returned to the temple in Emesa. The eventual fate of the Stone remains unknown. See Bradley E. Schaefer's article Meteors that changed the world for more information about Elagabalus and the Stone of Emesa. 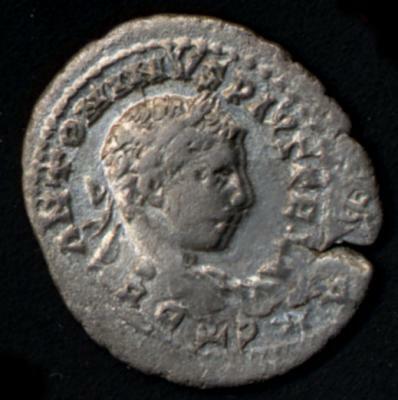 Also see Martin Armstrong's page about the coins of Elagabalus. 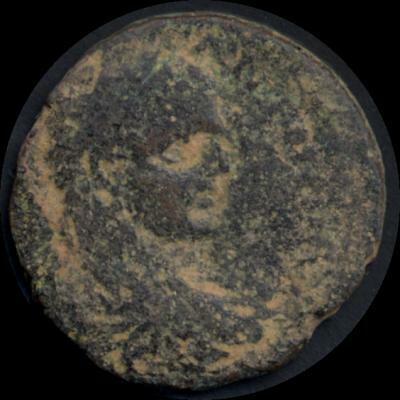 The face of this civic issue coin displays a turretted and draped bust of Tyche, the goddess of good fortune (Roman Fortuna). 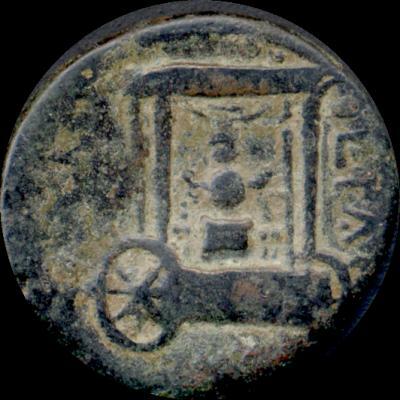 The reverse shows the wheeled cart of Astarte bearing a sacred stone, possibly the Stone of Emesa. However, Sidon possessed another sacred stone which was displayed in the cart of Astarte, so this may be that stone instead. 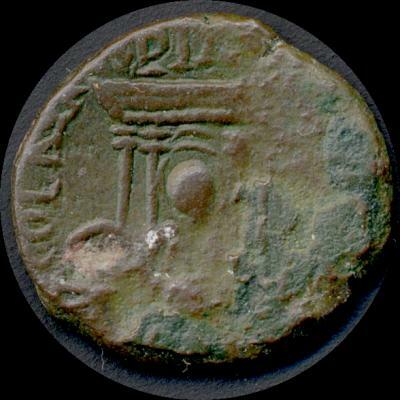 This coin was minted in Sidon during the reign of Trajan (A.D. 98-117). 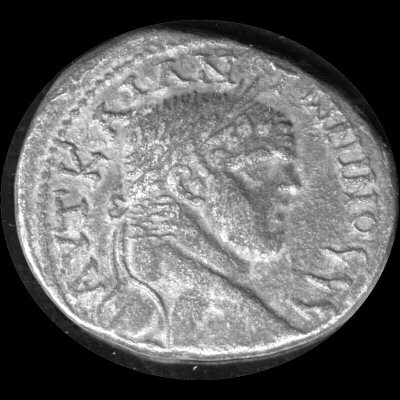 The face of this coin minted at Emesa shows a laureate bust of Antoninus Pius, who ruled A.D. 138-161. 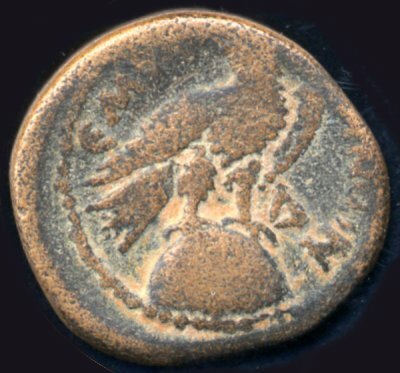 The reverse shows an eagle standing on the Stone of Emesa. This coin is very similar to the previous one. The face shows a laureate bust of Antoninus Pius. The reverse shows an eagle perched on the Stone of Emesa. This coin was probably minted at Emesa. The face of this tetradrachm shows a laureate bust of Caracalla. 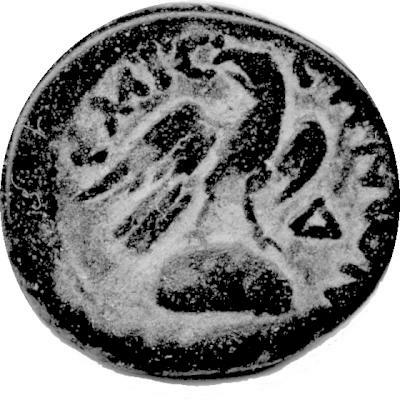 The reverse shows an eagle perched above the cart of Astarte bearing a sacred stone, presumably the Stone of Sidon where this coin was minted. 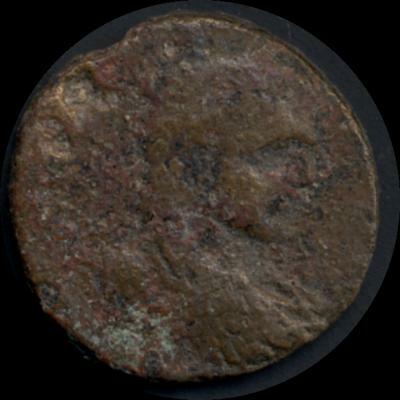 The face of this coin shows a draped and cuirassed bust of Caracalla, predecessor of Elagabalus. The reverse shows the Stone of Emesa ornamented with an eagle and flanked by two parasols, on a chariot drawn by four horses, tendril in exergue. This coin was minted in Jerusalem. 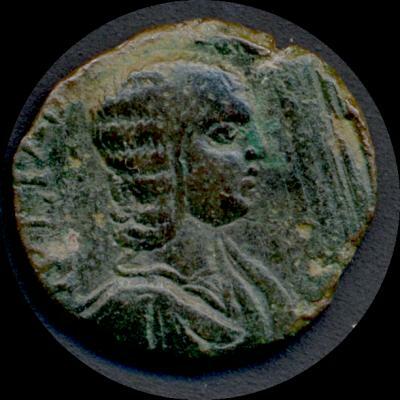 The face of this coin displays a draped bust of Julia Maesa, grandmother of Elagabalus. 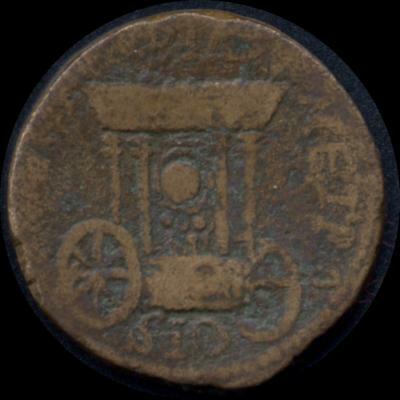 The reverse shows the cart of Astarte bearing the either the Stone of Emesa or the sacred stone of Sidon. This coin was minted in Sidon. The face of this denarius shows a draped and cuirased bust of Elagabalus. 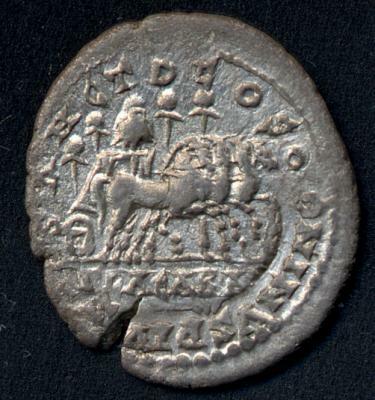 The reverse shows a quadriga (a cart pulled by four horses) bearing the Stone of Emesa. This coin was minted in Antioch. 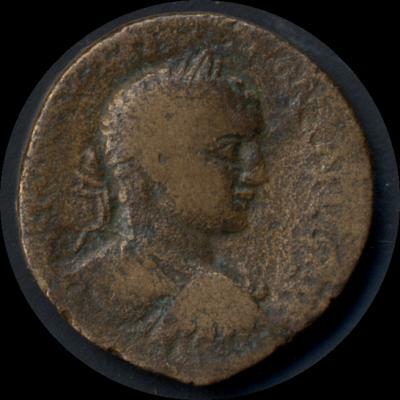 The face of this coin shows a laureate and draped bust of Elagabalus. 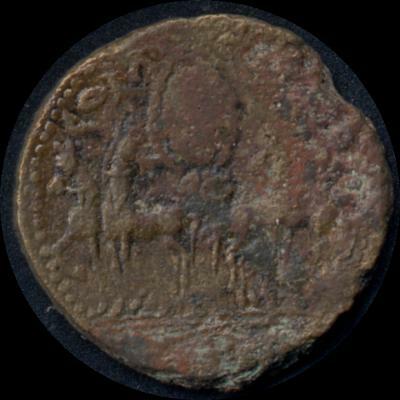 The reverse shows the Stone of Emesa in a facing quadriga. This coin was minted in Jerusalem. 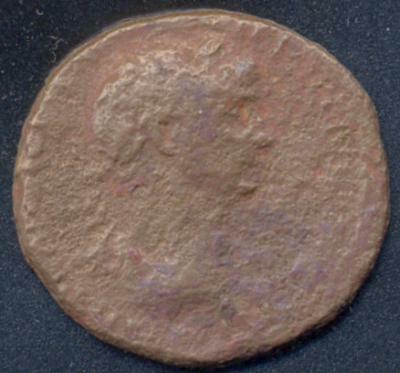 The face of this coin shows a laureate and draped bust of Elagabalus. 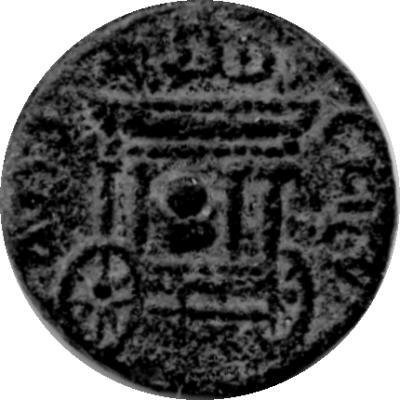 The reverse shows the Cart of Astarte bearing either the Stone of Emesa or the stone of Sidon. Small figures appear on either side. This coin was minted in Sidon. 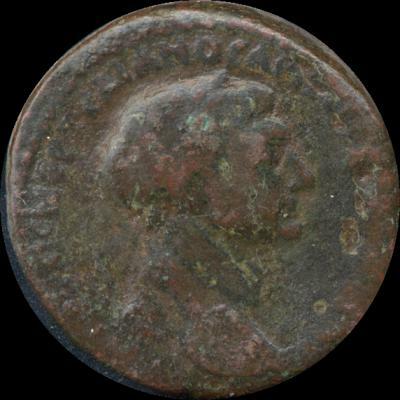 The face of this coin shows a laureate and draped bust of Elagabalus. 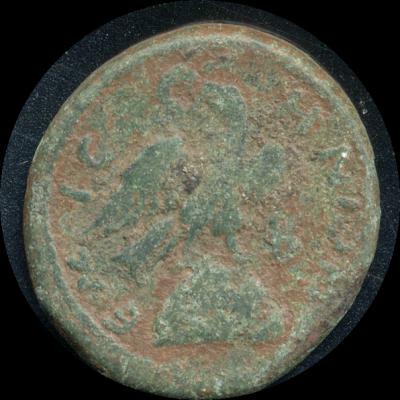 The reverse shows an eagle with wings spread standing on the Stone of Emesa. The eagle grasps a wreath in its beak. This coin was minted at Emesa. 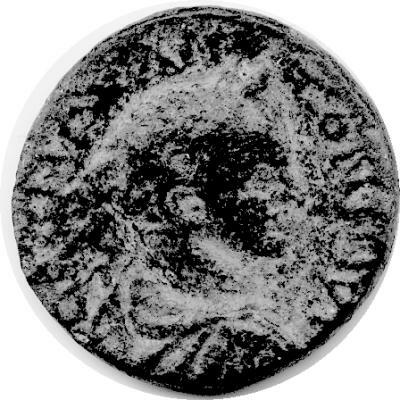 The face of this coin minted at Sidon shows a laureate bust of Elagabalus. 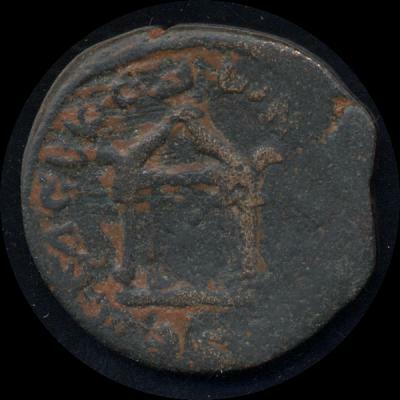 The reverse shows the cart of Astarte bearing a sacred stone, probably the Stone of Sidon. Dieter Heinlein kindly supplied scans of the stamps from Mongolia and Saudi Arabia. Mark Bostick kindly supplied scans of the Sikhote-Alin cover. Last modified by pib on December 19, 2003.